This week, I was given more freedom to assert myself as a leader in our classroom when working with small groups. In science, students had the opportunity to create their own “telegraph” by using electromagnets and send secret messages to another group by using a code. My CT asked me to lead the groups working outside of the classroom. While I initially struggled to keep students on task, make sure that the “telegraph” was working, and explain how to transfer messages– by the end of the week I had mastered my “spiel” and the students and I were able to efficiently complete the activity and have fun with it. I also started leading the Bananas, my guided reading group by introducing a novel called Cam Jansen and The Chocolate Fudge Mystery. My students immediately enjoyed the book and many of them were disappointed when the class period was over because they wanted to read more. The group I work with are considered to be in the strategic category for literacy which means that they need focused and clear support to continue improving their reading scores. They have been consistently improving the whole year, so I am hoping to keep that pattern up. One pattern I am hoping to break is all of the gossip we have been dealing with in our classes. My teacher always reacts as soon as the problem arises by discussing the issue with the student in the hallway. 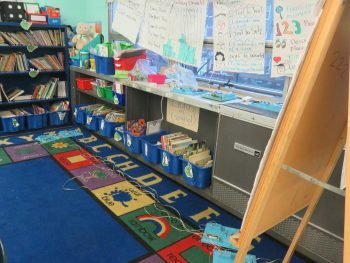 While I believe that this is an effective method to deal with the behaviors, it often leaves me in charge of the rest of the class for 5-10 minutes at a time. Although my CT is only on the other side of the door, the students take this an opportunity to act out. While I try and nip these behaviors as soon as they arise, students often ignore my attention getters, warnings, and directions leaving me frustrated and disappointed in myself and my inability to change their behavior. I shared my frustrations with my CT and she was very supportive, reminding me that it takes time to build a relationship of respect and that I should stop them as soon as they act out to redirect them. As far as my life in the city – this week I went to Troy LaRaviere’s Social J ustice talk on Wednesday at the University of Chicago. He discussed his encounters with racial prejudice and his work in CPS. This week end, I went to Los Comales with a friend who came to visit me. 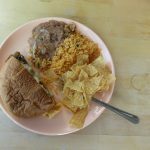 I decided to switch it up from my usual carne asada tacos for a torta – que rico! 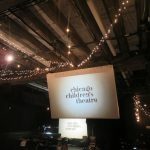 I also went to see Magic City at the Chicago Children’s Theater which I loved due to the use of shadow work and childlike storytelling. I have also been working on lesson plans for this coming week since I will be taking over reading for 222 and introducing Frindle. During the rest of the week I will begin completing self-evaluations, my first observation, and starting to plan for EdTPA which I will begin teaching/recording the following week!